What Information Do SDSs Require? List of hazardous chemicals in the workplace, with each product identity referenced to an SDS. System of labeling for workplace containers (which does not have to be fully implemented until June 1, 2016). Methods to inform employees about the hazards of non-routine tasks. Hazards associated with chemicals located in unlabeled pipes in work areas. Methods to detect the release of hazardous chemicals into the work area. Hazards of chemicals in the work area, including physical hazards, health hazards, simple asphyxiation, combustible dust, pyrophoric gas, and "not otherwise classified" hazards. Measures employees could take to protect themselves from exposures, including appropriate work practices, emergency procedures, and the proper use of appropriate PPE. Explanations of SDSs [which should continue to consider legacy MSDSs], labels, similar documents, and methods of obtaining and using appropriate hazard information. OSHA requires that these written programs designate persons responsible for each task (acquiring and filing SDSs, preparing and affixing labels, etc.). The written hazard communication program must be made available, on request, to employees, their representatives, or OSHA/state officials. Has the organization prepared a written Hazcom program for each workplace where hazardous chemicals are handled? Does each Hazcom program already meet the GHS standards provided in the revised Hazcom, including detailed hazard determination, classification and response? Has the organization procured an SDS for each hazardous chemical? If not, is there a plan in place to replace existing MSDSs? 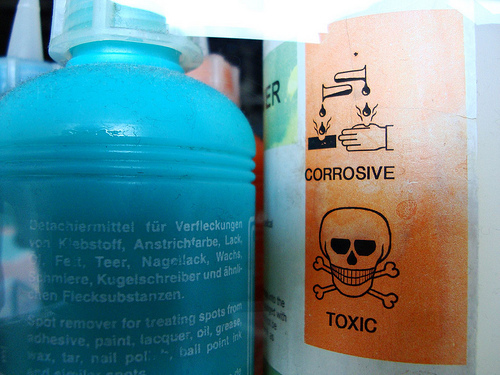 Has each chemical supplier updated its labeling? Has the organization revised its Hazcom training program(s)? Has the organization scheduled revisions to its workplace labeling practices?